Image searches on the web reveal many varied reconstructions of how Titanis walleri might have appeared in life. Scientists claim to have more accurately ‘dated’ the arrival of a prehistoric ‘terror bird’ on the North American continent.1 Titanis walleri is estimated to have been some 2 m (7 ft) tall, weighing some 150 kg (330 pounds). Considered to be a flightless carnivorous bird, Titanis walleri has often been portrayed as an explosively fast creature whose enormous beak was utilized to rip apart dog-sized prey. Previously ‘dated’ at 10,000 years old, the Titanis fossils have now been moved back to 2 million years old on the evolutionary time scale. It would behoove creationists to critically analyze the reputation of this so-called terror bird and its newly declared geological age. The scientists arrived at the ‘2 million years old’ date by implementing a new dating technique which measures metal concentrations in fossil bones surrounded by groundwater.1 The new date is 200 times ‘older’ than the previous date accepted by most paleontologists. Once again, different dating methods have produced extremely discordant results. …many ‘prehistoric’ creatures have been blown up to mythological proportions. 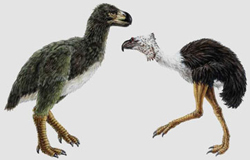 Titanis is classified as a carnivorous terror bird based on its beak size and shape. However, behavior and diet cannot always be accurately deduced from fossil bones. It is certainly plausible that Titanis consumed meat as part of its diet. It is also plausible that it consumed large quantities of fruits and nuts with its huge beak. It may appear ridiculous at first, but there is observational evidence to support this possibility. The palm nut vulture, native to Africa, feeds almost exclusively on the fleshy outer portions (husk) of the fruit of the oil palm (Elaeis guineensis), or, less frequently, Raphia palm (Raphia spp. ).3 Despite its razor-sharp hooked beak and ‘vicious’ talons, the palm nut vulture subsists on a virtually vegetarian diet. There is also the true account of ‘Little Tyke’, a lioness who lived her entire lifetime of nine years in captivity rejecting meat.4 She thrived on a diet of grains, milk, and eggs. Then there is the report of alligators eating substantial quantities of vegetables, even fruit, at an alligator farm in St. Augustine, Florida. The report says that ‘it is now a common sight to see the alligators at the tortoise bowls, eating romaine lettuce and yellow squash. Sometimes the alligators even beat the tortoises to the dishes. We have had plenty of opportunities to record this behavior on videotape.’5 There is also the kinkajou, which one research team was shocked to discover survived exclusively on fruit, leaves, flowers, and nectar, despite having the skull structure and teeth characteristic of a carnivore.6 Coyotes, bears, bats, and piranhas are just a few of the other animals who supplement their diets with vegetarian sources despite possessing carnivorous ‘hardware’ and belligerent reputations. Perhaps the most famous example of prehistoric hyperbole is Tyrannosaurus rex. Movies such as ‘Jurassic Park’ and television shows often portray T. rex as an enormously massive, lightning fast, rampaging killer which eats everything in sight. However, this image may be based more on myth than hard scientific data. Creationists can learn many valuable lessons from Titanis walleri. First, the ‘age’ of fossils can be very different according to who is doing the estimate, highly dependent on the prior assumptions of the scientist, and prone to significant alteration with just a single discovery. Second, the behavior, lifestyle, and diet of creatures cannot always be accurately assessed simply by looking at fossil bones, beaks, and teeth. Third, many ‘prehistoric’ creatures have been blown up to mythological proportions. Fourth, mankind can easily coexist with and subdue a number of massive and unpredictable beasts. Fifth, the book of Genesis provides us with the most reliable historical and scientific framework that doesn’t change with every new whim of the scientific community. Bryner, J., Terrifying bird once roamed the Americas, LiveScience, http://www.msnbc.msn.com/id/16772169/, 7 February 2007. Return to text. Interesting facts from the American Ostrich Association, http://www.ostriches.org/faq.html , 7 February 2007. Return to text. Catchpoole, D., The lion that wouldn’t eat meat, Creation 22(2):22–23, 2000. Return to text. Crocodilians eating their vegetables, Crocodile Specialist Group Newsletter 21(3):15–17, July-Sept 2002; online at: http://www.flmnh.ufl.edu/natsci/HERPETOLOGY/NEWSLETTER/news213p15–17.htm. Return to text. Catchpoole, D., Catching a kinkajou, Creation 26(3):42–43, 2004. Return to text. Amos, J., T.rex goes on trial, BBC News, http://news.bbc.co.uk/1/hi/sci/tech/3112527.stm, 7 February 2007. Return to text. T. rex —Warrior or wimp?, Transcript of Horizon program broadcast on BBC Two on 11 March 2004, http://www.bbc.co.uk/science/horizon/2004/trextrans.shtml, 7 February 2007. Return to text. Wong, K., T.rex not fleet of foot, study shows, Scientific American.com, http://www.sciam.com/article.cfm?articleID=0002F3A8–5199–1CCF-B4A8809EC588EEDF, 7 February 2007. Return to text. Can elephants really run? Yes and no, say researchers, University of Colorado News Release, 7 February 2007. Return to text. Wikipedia entry re ‘Elephant’, 7 February 2007. Return to text. All this is without even considering the analyses (by evolutionists themselves) which show that if the large tyrannosaurs had tripped while running too fast, the force of impact would have likely killed them. See The bigger they are… Return to text.